RosterWatch makes dominating your league look easy. How? TOOLS. Fantasy tools that are so simple and effective that anyone can begin winning immediately, whether season-long or DFS. RosterWatch, based in Austin, Texas, is the only fantasy intel source with in-person coverage of the entire offseason, giving you a serious leg up on ALL of your competition. They are there, on the ground: Senior Bowl, NFL Combine, University Pro Days, NFL Training Camps – Alex Dunlap and Byron Lambert are the experts on the scene, and The Trashman is your secret weapon. RosterWatch covers it all, and this means the best fantasy football tools on the planet. As heard year-round on the Sirius XM Radio Fantasy Sports Channel since 2012 (click here for schedule), RosterWatch.com has gained popularity from the Ultimate Draft Cheat Sheet, legendary Matchup Tool, HyperDFS lineup generator, and much more. Now an industry standard, they created the Touchdown Dependency Metric back in 2011. And, their industry-first “Vegas Tool” delivers weekly fantasy picks from an exclusive network of Vegas insiders. Join their lively football community for the maniacal analysis 24/7/365. Welcome to RosterWatch Nation! RosterWatch is an “Approved Expert” on the FantasyPros.com network. You can also find us on Twitter and Facebook. RosterWatch is on the move. Our visitor base keeps growing because of the exclusive content we offer and our exposure through a broad spectrum of media: Website, Twitter, YouTube, Facebook and of course, the RosterWatch SiriusXM radio show. We work with our sponsors to ensure the absolute best execution and measurable ROI. Contact us today to discuss cost-effective interaction with the world’s most devoted sports fans. ESPN.com article featuring Byron Lambert from RosterWatch. Organizations partner to collect and distribute real-time performance data from pro football draft prospects throughout the week of Senior Bowl practice, to benefit teams, football fans and the media. 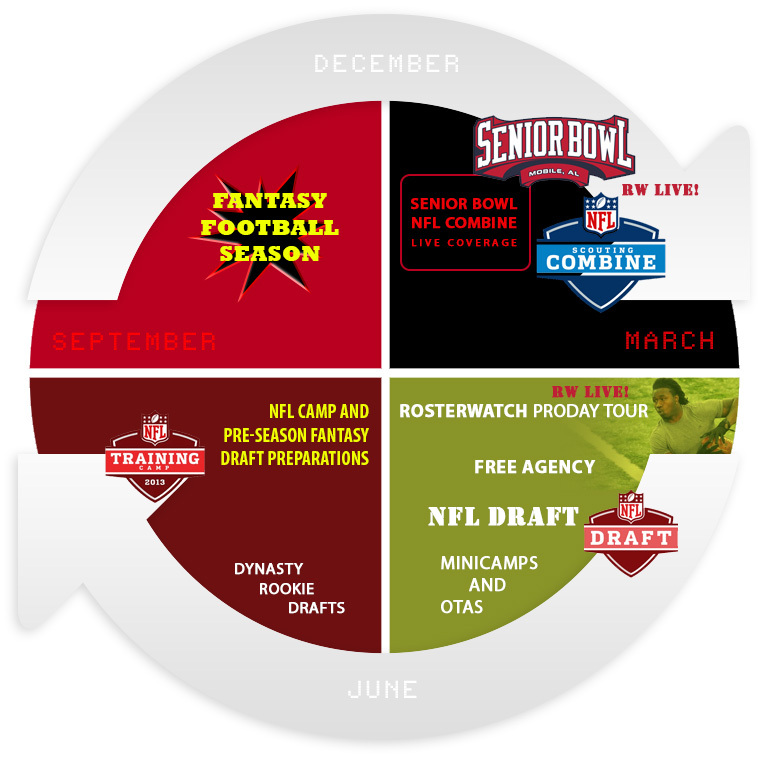 MOBILE, Ala., Jan. 25, 2017 — RosterWatch, a leading independent pro football player-analysis and fantasy football intelligence company, today announced a partnership with The Reese’s Senior Bowl and Catapult to provide real-time player performance data from the week of practice – January 23-27 –immediately preceding the Senior Bowl event on January 28. This co-operative venture aims to dramatically expand the pool of pro football draft-prospect data available at this point in the pro football calendar. This cooperative program will benefit pro scouts, who increasingly rely on fine-tuned player analytics to grade each player and predict future production on the field. The teams will also see safety-related benefits, as the detailed data helps them gauge the health effects of the week’s work outs, with accurate measurements of individual player loads. Football fans and the media will also have access to more in-depth metrics for aspiring pro football rookies than ever before, during broadcast and throughout the 2017 pre-season. The partnership has empowered Catapult to install its PlayerLoad® performance tracking device into each Senior Bowl player’s uniform, reporting complete player measurements that quantify performance, including full body fitness stats throughout each workout and inertial movement analysis. The Reese’s Senior Bowl is college football’s premier senior showcase event, annually featuring the nation’s best senior collegiate football stars and top NFL draft prospects on teams coached by NFL coaching staffs. Reese’s Senior Bowl practices and game week festivities are attended by nearly 1,000 general managers, head coaches, assistant coaches, scouts and other front office personnel from all 32 National Football League teams, making Mobile and the Reese’s Senior Bowl the week-long host to a one-of-a-kind NFL Coaches Convention. For more information on the 2017 Senior Bowl please visit the bowl’s website at www.seniorbowl.com. Catapult enlightens sport with scientifically-validated analytics, obtained with the most advanced wearable technology in the world. With precision engineering at the intersection of sports science and sports analytics, Catapult works with over 900 elite teams worldwide to innovate how information shapes athletic performance. With over 250 performance metrics, Catapult’s powerful analytics engine enables personalised value in the mitigation of risk of injury, measuring readiness for competition, and quantifying return to play. Catapult is based in Melbourne, Chicago and Leeds. For more information, visit www.catapultsports.com. RosterWatch Inc., based in Austin, Texas, is an independent provider of year-round pro football player analysis and fantasy football intelligence. Its partner-analysts are sports performance experts with academic preparation comprised of six combined degrees in various methods of statistical evaluation and game theory, and over 50 years of fantasy sports and gaming experience. RosterWatch entertains an international fantasy sports audience via their weekly radio show on SiriusXM Radio, and is an “Approved Expert” on the FantasyPros.com network. On the web: www.rosterwatch.com and www.twitter.com/rosterwatch. AUSTIN, Texas, October 15, 2015 — RosterWatch, a leading independent NFL player-analysis and fantasy football intelligence company, announced today a top-2 finish, awarded in the NFL Week 5 2015 head-to-head rankings on FantasyPros.com, the leading expert-accuracy verification website for fantasy sports. RosterWatch had already established a strong record, receiving 49 Weekly Expert Awards and 2 Silver Expert Awards over the past 4 NFL seasons. RosterWatch analysts post updates about fantasy football strategy, news, and strategic insight to www.rosterwatch.com daily, including rankings, player spotlights, and much more to help fantasy players make informed choices. 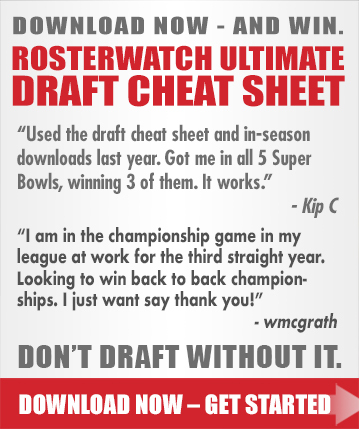 RosterWatch’s subscription-based Ultimate Cheat Sheet provides expert pro football picks throughout the season. RosterWatch Inc., based in Austin, Texas, is an independent provider of year-round NFL player analysis and fantasy football intelligence. Its partner-analysts are sports performance experts with academic preparation comprised of six combined degrees in various methods of statistical evaluation and game theory, and over 50 years of fantasy sports and gaming experience. RosterWatch entertains an international fantasy sports audience via their weekly radio show on SiriusXM Radio, and is an “Approved Expert” on the FantasyPros.com network. On the web: www.rosterwatch.com and www.twitter.com/rosterwatch.